In the movie “Terminator 2,” the shape-shifting T-1000 robot morphs into a liquid state to squeeze through tight spaces or to repair itself when harmed. Now a phase-changing material built from wax and foam, and capable of switching between hard and soft states, could allow even low-cost robots to perform the same feat. The material developed by Anette Hosoi, a professor of mechanical engineering and applied mathematics at MIT, and her former graduate student Nadia Cheng, alongside researchers at the Max Planck Institute for Dynamics and Self-Organization and Stony Brook University could be used to build deformable surgical robots. The robots could move through the body to reach a particular point without damaging any of the organs or vessels along the way. Robots built from the material, which is described in a new paper in the journal Macromolecular Materials and Engineering, could also be used in search-and-rescue operations to squeeze through rubble looking for survivors, Hosoi says. Working with robotics company Boston Dynamics, based in Waltham, Mass., the researchers began developing the material as part of the Chemical Robots program of the Defense Advanced Research Projects Agency (DARPA). The agency was interested in “squishy” robots capable of squeezing through tight spaces and then expanding again to move around a given area, Hosoi says much as octopuses do. What’s more, controlling a very soft structure is extremely difficult: It is much harder to predict how the material will move, and what shapes it will form, than it is with a rigid robot. So the researchers decided that the only way to build a deformable robot would be to develop a material that can switch between a soft and hard state, Hosoi says. “If you’re trying to squeeze under a door, for example, you should opt for a soft state, but if you want to pick up a hammer or open a window, you need at least part of the machine to be rigid,” she says. To build a material capable of shifting between squishy and rigid states, the researchers coated a foam structure in wax. They chose foam because it can be squeezed into a small fraction of its normal size, but once released will bounce back to its original shape. The wax coating, meanwhile, can change from a hard outer shell to a soft, pliable surface with moderate heating. This could be done by running a wire along each of the coated foam struts and then applying a current to heat up and melt the surrounding wax. Turning off the current again would allow the material to cool down and return to its rigid state. To build the material, the researchers simply placed the polyurethane foam in a bath of melted wax. They then squeezed the foam to encourage it to soak up the wax, Cheng says. “A lot of materials innovation can be very expensive, but in this case you could just buy really low-cost polyurethane foam and some wax from a craft store,” she says. 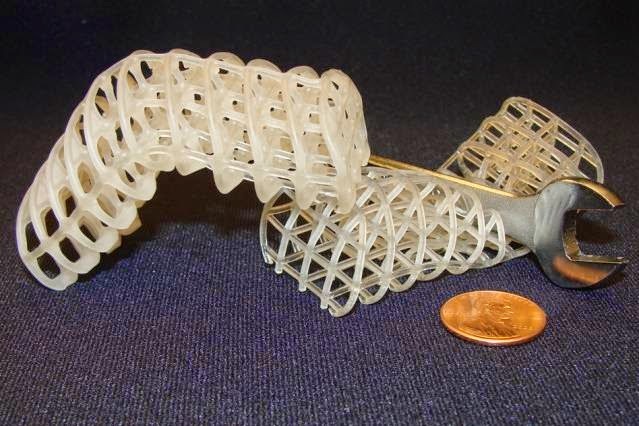 In order to study the properties of the material in more detail, they then used a 3-D printer to build a second version of the foam lattice structure, to allow them to carefully control the position of each of the struts and pores. When they tested the two materials, they found that the printed lattice was more amenable to analysis than the polyurethane foam, although the latter would still be fine for low-cost applications, Hosoi says. The wax coating could also be replaced by a stronger material, such as solder, she adds. Hosoi is now investigating the use of other unconventional materials for robotics, such as magnetorheological and electrorheological fluids. These materials consist of a liquid with particles suspended inside, and can be made to switch from a soft to a rigid state with the application of a magnetic or electric field.